The minute we think about Indian Military, a flood of images and emotions run across our mind and body. They’re the people who guard our borders, who lay down their lives for us, and who’re much like us – except they live under extremely tough conditions, just for our sake. That’s why our armed forces command such respect from all of us. Since they’re there for us, it’s our job to ensure that they get the best protection from enemy and the harsh conditions they work under – be it the arms or safety gear for their body, they deserve the best stuffs. That’s why, Liberty – the only Indian company to get featured among world’s top 5 leather footwear companies – launched a new range of safety shoes and work boots that is so much advance and exciting – the footwear safety gear is named ‘Warrior’. Our military men wear these shoes for long hours – and thus, these shoes have to be flexible, comfortable, and extremely light-weight. Else, they will find it difficult moving around on tough surfaces – even their movements can be restricted if the shoes aren’t flexible enough. As India’s leading safety shoes and boots manufacturer and supplier, we’ve designed Warrior safety shoes and boots to be very comfortable and lightweight. They also score high when it comes to the protection – the composite toe caps can withstand extreme shocks and keep the wearer safe & sound. The wider toe area also enables finger movements enhancing comfort. The cushioned insoles of military combat boots provide better comfort. And comfort is something that cannot be compromised - after all, the military men will wear these shoes for long hours, and almost every single day. Our high quality cushioned insoles are designed to be durable and provide great comfort to the feet. We understand that the shoes have to be durable and withstand the conditions our army men work under – that’s why only high quality materials – such as leather and steel – go in the making of Warrior safety shoes and work boots. The shoes are tested rigorously on several quality parameters before they’re dispatched to their destinations. Now that these shoes tend to perform for long, they’re considered extremely cost-effective. 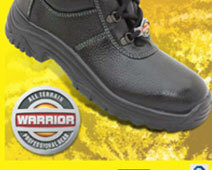 Years of research & development has gone in the designing and manufacturing of Warrior safety shoes and work boots. 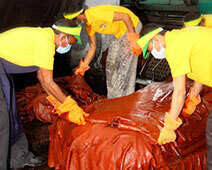 They’ve an excellent resistance to heat and oil - and therefore, when our forces have to work on heated or oiled surfaces, they just don’t seem to bother at all. We just shared with you 4 top benefits of our range of military combat boots. If there is something more you want to know about this collection, please drop us a comment.